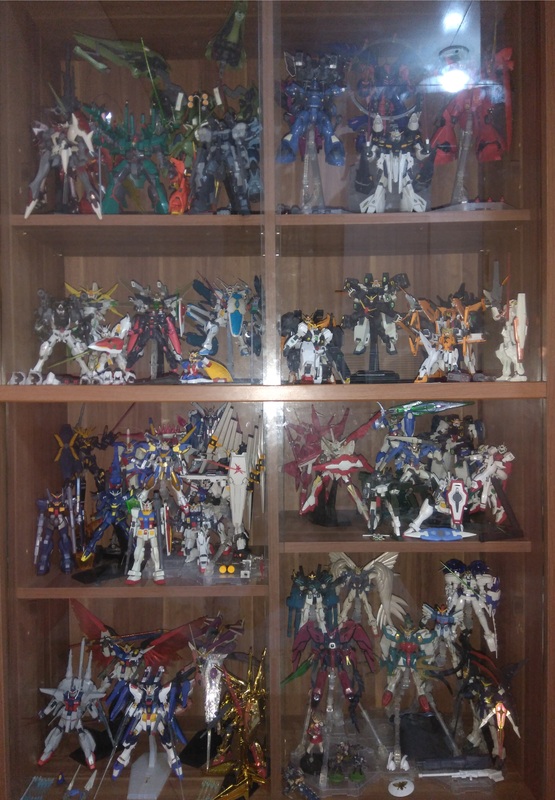 This cubicle on my shelf along with the next both contain my collection of HG 1/144 non-Gundam mobile suits. 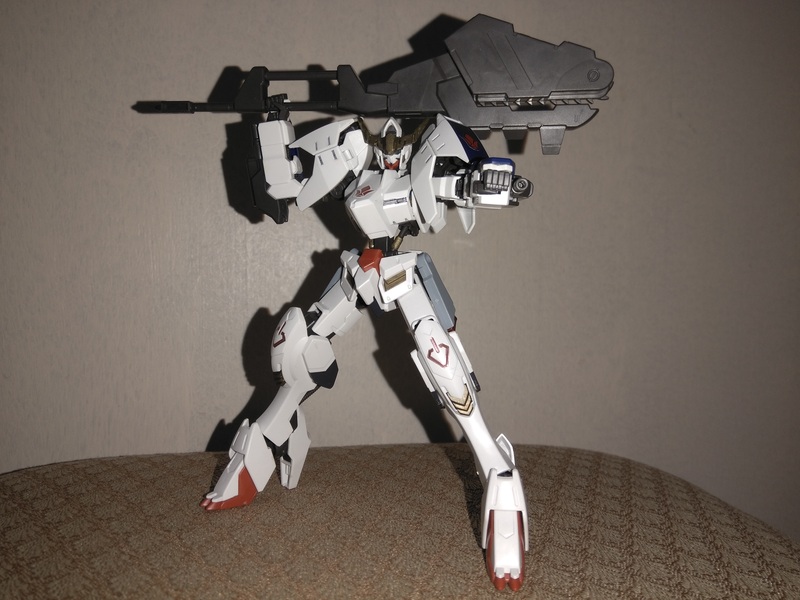 The Doven Wolf is probably the best MS kit that I have on the shelf excluding Gundam types. It comes with a whopping 11 ranged weapon accessories and can brandish all of them at once without any need for customization...make that 12 if you choose to separate the rifle from the particle cannon in its abdomen. The Kshatriya has 2 different beam saber blades to match its appearance to the anime after it stole a beam saber from a ReZEL. When attempting to color the crest on the Bawoo's chest area with gold Gundam Marker, the paint spilled all over the tiny area. But when I used a Gundam Marker eraser, it actually worked out pretty well, leaving the gold paint only on the engraved crest itself. I bought a Susanoo because I think that this is the best representation of a samurai-themed MS since the head unit actually looks like a Kabuto. I also bought a Garazzo just to use its hands to customize my Seraphim in another cubicle, but figured I'd snap the kit together as well. The legs reminded me of Orbital Frames from the ZOE series, so I thought it looked quite good. I moved the Garazzo to the left side of the cubicle to accommodate my recently acquired Gouf Custom, which was well worth the money I spent for it. 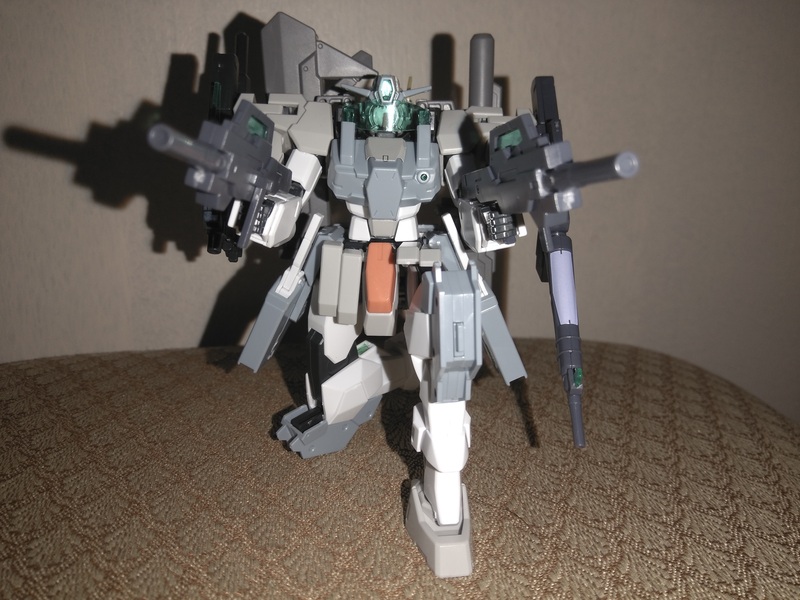 Thanks to one of those old Seed stands, I was able to accommodate a Jesta Cannon here as well. I even modified the beam rifle on the left hand to allow it to dual-wield. The Sinanju actually exploded into pieces when it dropped to the floor while I was cleaning. 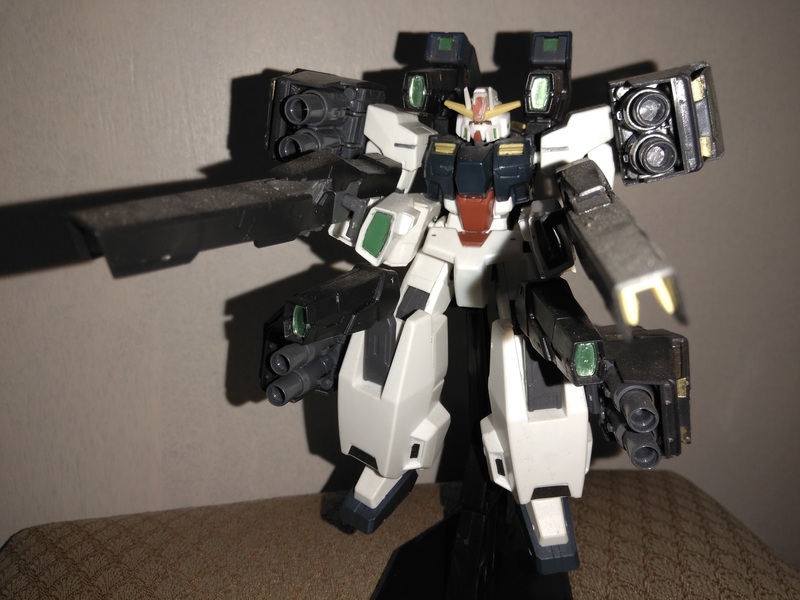 I lost its horn, its left cuff or sleeve, the scope on its rifle and the backpack connector piece that allows it to mount the wings or thrusters and propellant tanks. After a few months, I was able to restore it by buying another, along with a bazooka and a head base. Now the shield has 4 beam tomahawks and the stock grenade launcher equipped underneath. Quite the blessing in disguise there. In this cubicle, I managed to mount a pair of tri-barrel gatling guns over the shoulders of the Kampfer while allowing its bazookas to swivel forward. I'm quite happy with the result. Since I bought a Sinanju in the previous cubicle, I just had to buy a Sazabi to go with it, so here it is. Despite the frustration that I encountered in using the stock hands of the Gabthley, I realized that the rest of the kit was actually pretty good. So, I fiddled with the Sazabi and the Qubeley to give it some room in the cubicle. It fits, so I'm not complaining. 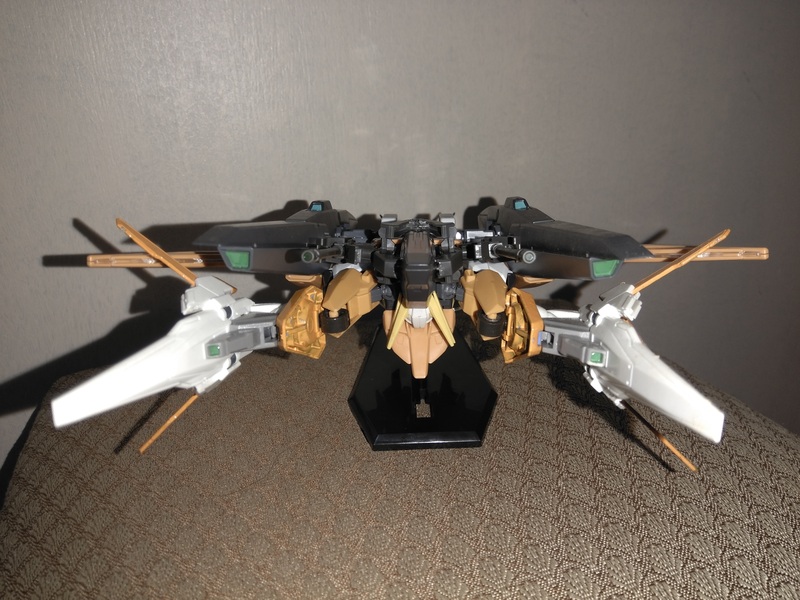 My Qubeley is from MC Model because I am not sure if there is an HG of a Qubeley with 30 funnels and two shoulder-mounted cannons released by Bandai. I bought two Gaplant TR-5 Hrairoos because I wanted to customize one by giving it two gun-type shoulder units, two blade rifles and two manipulator arms to mount the blade rifles over the shoulder units. 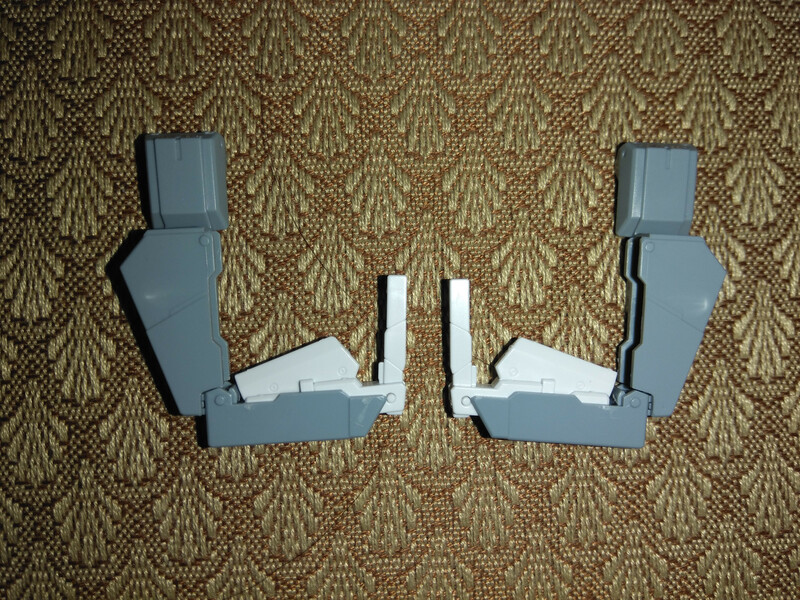 I bought two Rozen Zulus because I broke the pegs while building one of its forearms. I first thought that I could make do with extra thin cement, but decided to buy a second one instead. 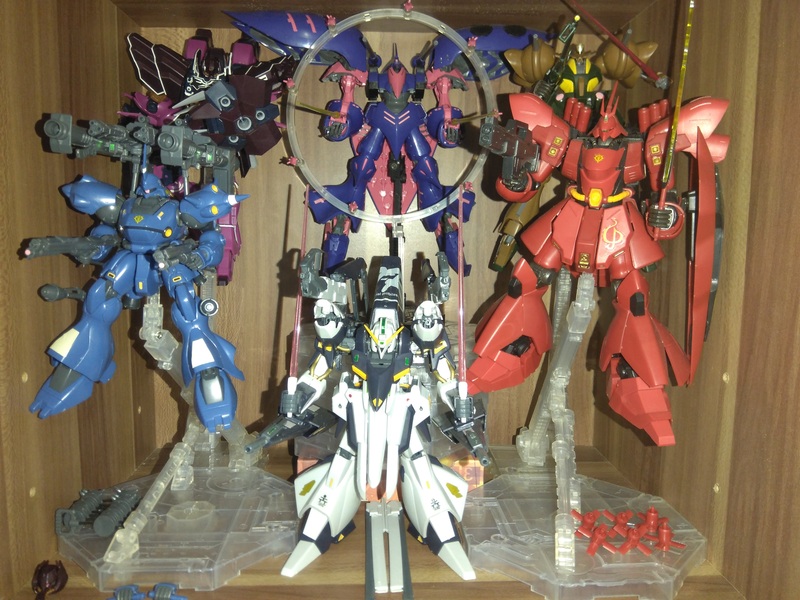 Now the Rozen Zulu on my shelf dual wields its shield units. I also have two extra claw units that I've assembled in INCOM mode aside from the ones already mounted on the arms. I even have enough clear bases to mount all six of its "rose bits" and both of the wired INCOM claws. Another blessing in disguise. The Rozen Zulu, Qubeley Mass Production Type, Kampfer and Hrairoo are all symmetrical dual wielders. So yeah...that's pretty cool IMHO. My second Hrairoo and Kyrios in MA mode can't really fit anywhere in the shelf, so I leave them on my work desk. I figured I'd snap them together since there were enough parts for a second complete build anyway. 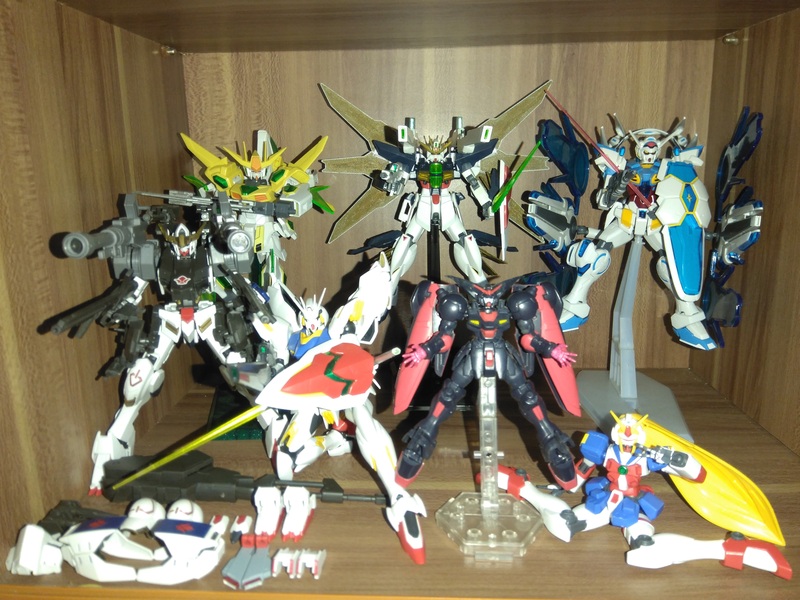 I just keep them in MA mode so that I don't have to fiddle around and transform the ones on my shelf. There were no decals left for the second Hrairoo, though. I used all of 'em on the first one. Another thing is that there are no gun-type shoulder units on this kit. The only ones I was left with were two of the sealed i-field type shoulders. Surprisingly, the action base connector that comes with the ZZ works quite well with the Hrairoo in MA mode...way better than mounting it on the stand that it comes with. Just lay it on a flat surface and use the ZZ's MA connector piece to stabilize the Hrairoo. 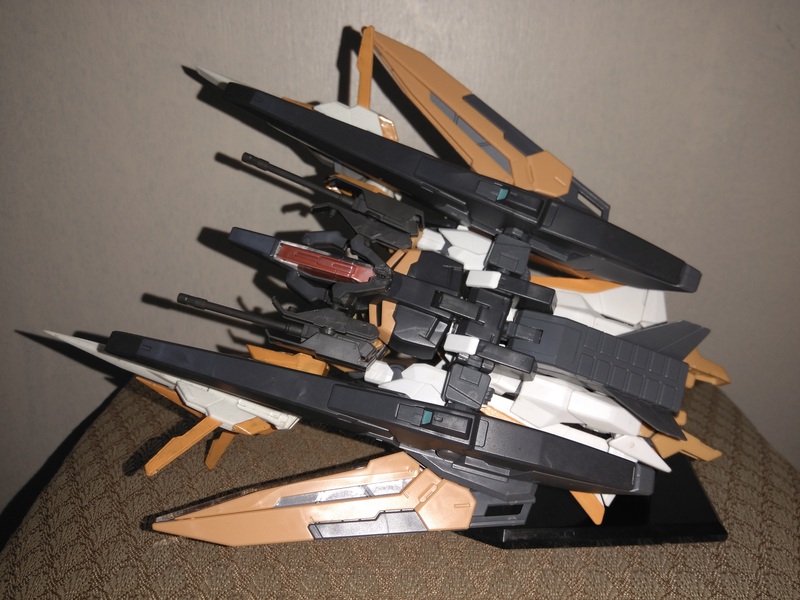 The MA Kyrios does not have any weapons since the pair of guns and shields are on the MS Kyrios in my shelf. 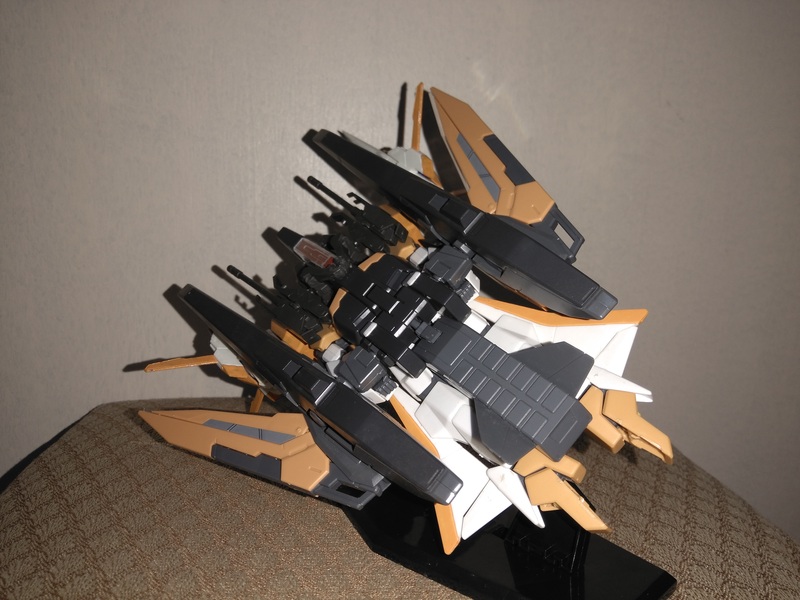 Still, the MA Kyrios turned out well when I decided to follow Prime92's recommendation of how to transform it. 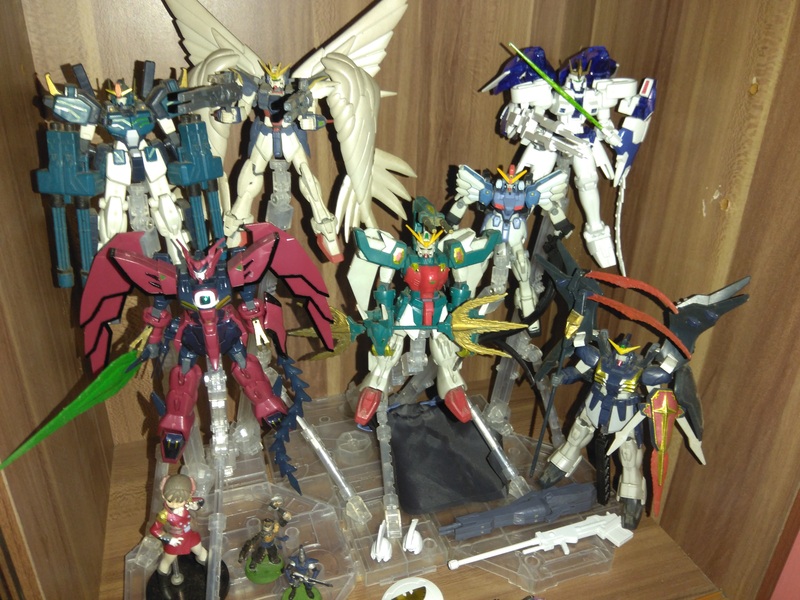 The first cubicle on the second row of my shelf contains various Gundam-type suits from alternate universes. I particularly like how the Legilis is capable of unassisted kneeling. 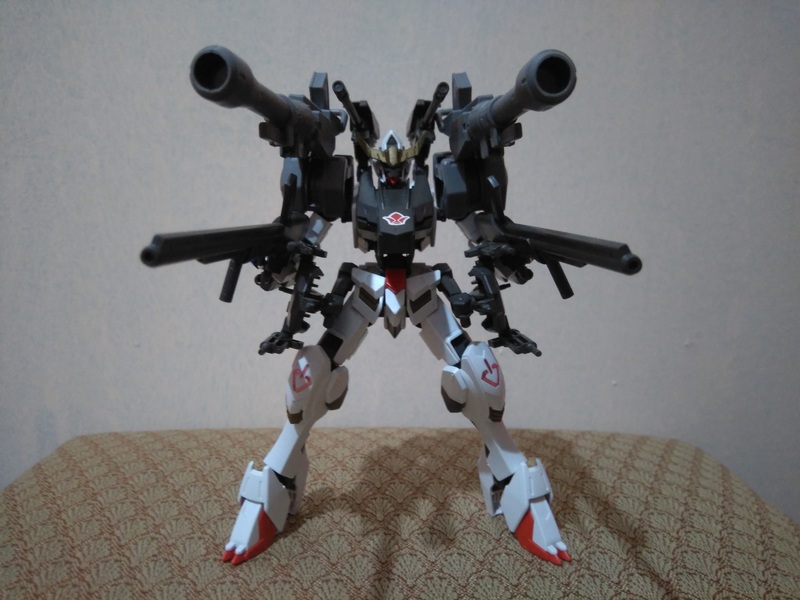 Another kit with a simple design, good weapons loadout and awesome articulation. 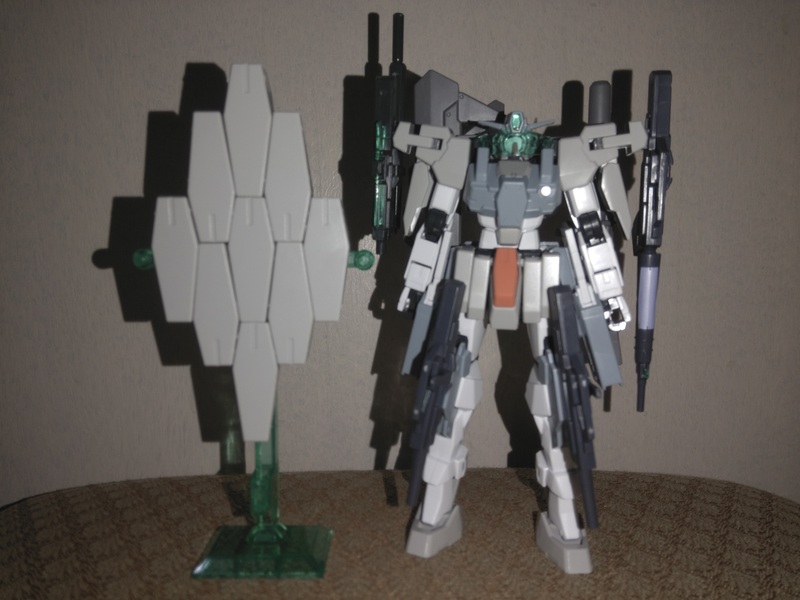 The antithesis to that is the HG G-Self with Perfect Pack. 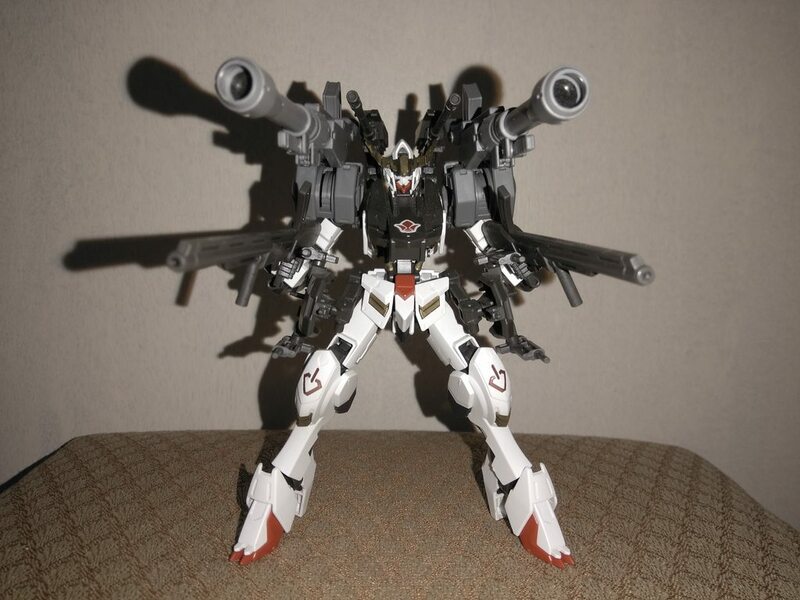 I'm glad that it comes with its own stand and how it can brandish all of its ranged weapons at the same time. I got the Assault Kingdom Master Gundam completely through sheer luck. I found it in a Christmas garage sale in my village, still in its unopened box and at an extremely low price. I figured, "screw it...I can't let this opportunity pass," so here it is, front and center. 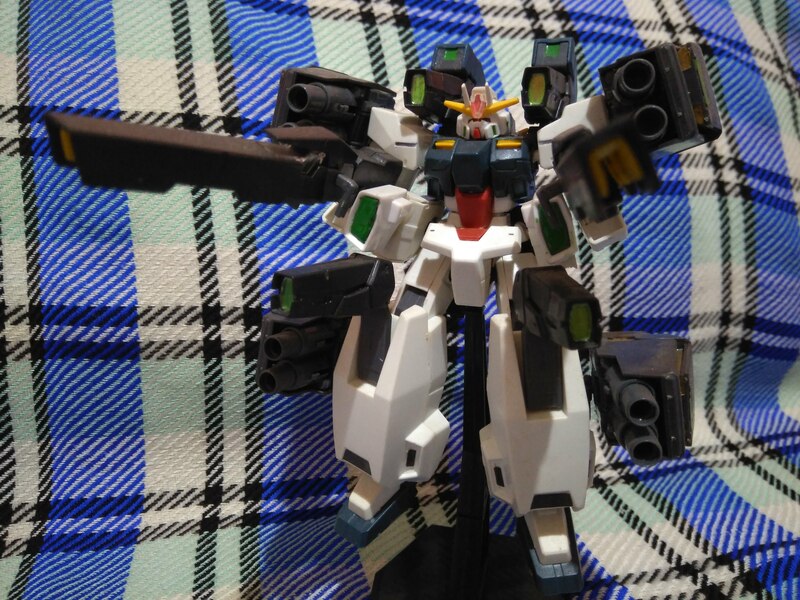 The Double X is one of three Gundams that have bona fide superweapons, so I had to get it. In this case, it is the Twin Satellite Cannon. The other two are the Physalis (Nuclear Bazooka) and the Turn A (Moonlight Butterfly). I'm not sure if there are others. I opted to get the Star Winning Gundam because it is the only kit that I know of that can transform between three modes: SD, MS and MA. Another kit here is the HG Barbatos Form 6. The customization options on the thing are insane! While other kits provide vast weapon accessories, The Barbatos Form 6 comes with various armor accessories that are easy to interchange. Completely unexpected as it was sent to me as a gift, but I'm really glad I have it. The most recent addition is the HG Nobell that I literally waited for years just to procure. It just managed to become locally available, so I got it immediately when it came in. This next cubicle contains my kits from the old HG Seed line. I heavily customized the first three kits. 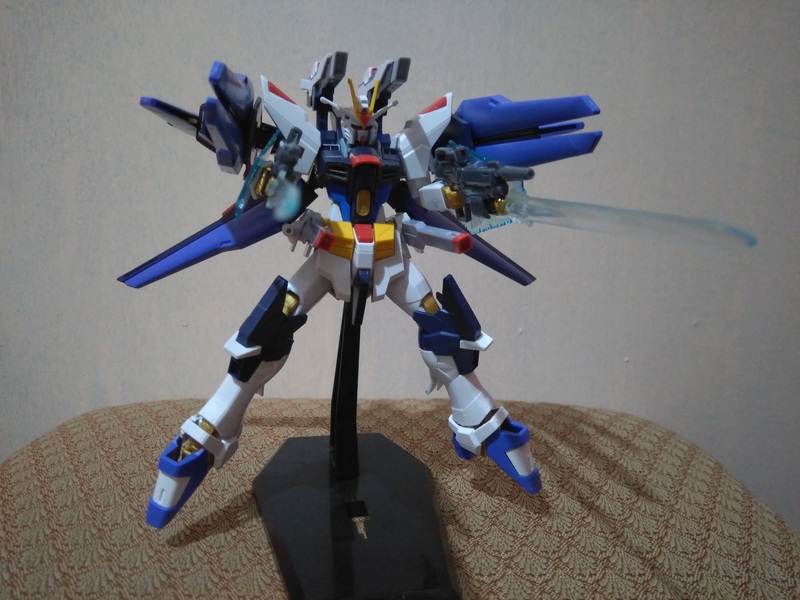 I bought a Strike Freedom Revive and an Amazing Strike Freedom, taking my preferred parts from both to come up with a custom kit. The Destiny "recovered" from another cleaning accident since I bought a second one, allowing me to replace its lost V-fin, right wing and left leg. 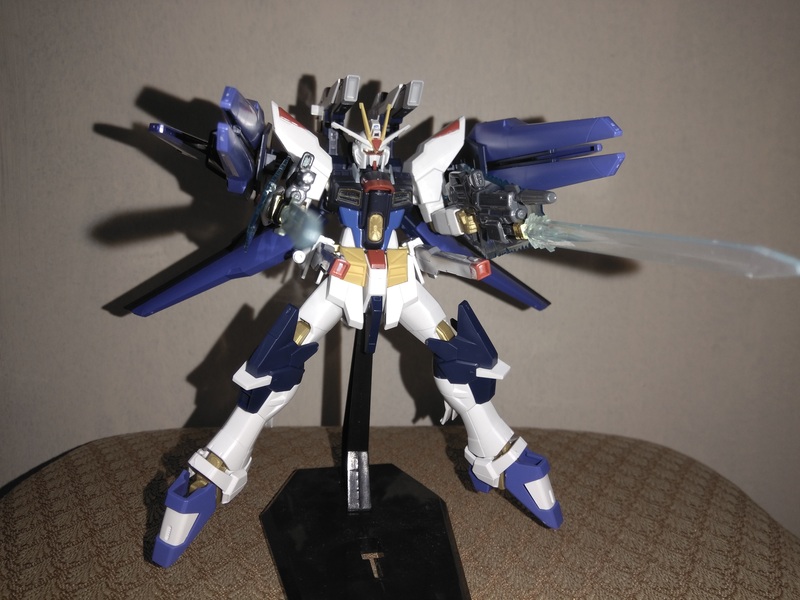 Now, it comes with the sword from the NG Sword Strike Gundam I got when I was in college. The NG Sword Strike did not survive until the present. 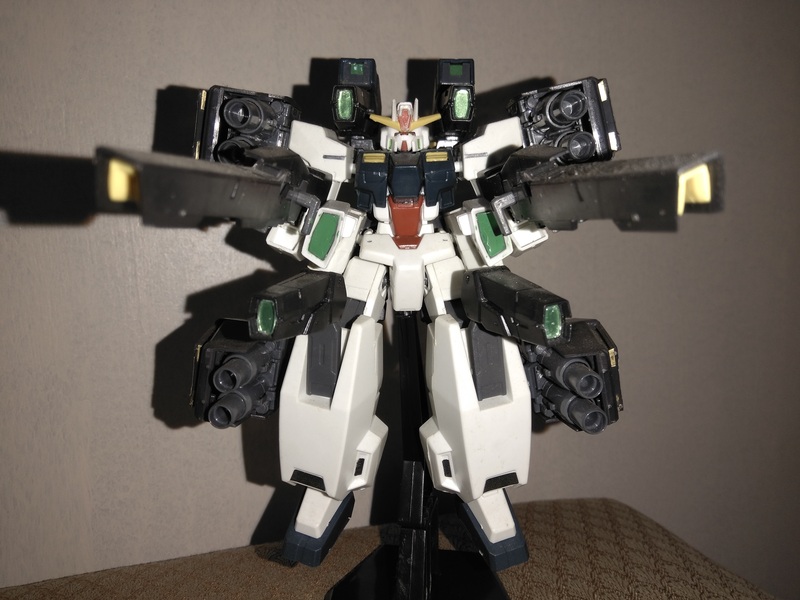 I also added the chest beam cannon from an NG Abyss Gundam to the Destiny's own chest, and I also equipped 2 back mounted anti-ship beam cannons on either side of the Gundam. The Infinite Justice comes equipped with the NG Savior Gundam's beam cannons on top of the Fatum backpack. The wingtips of the Fatum also contain the gun pods of the NG Abyss Gundam's shoulder armor. 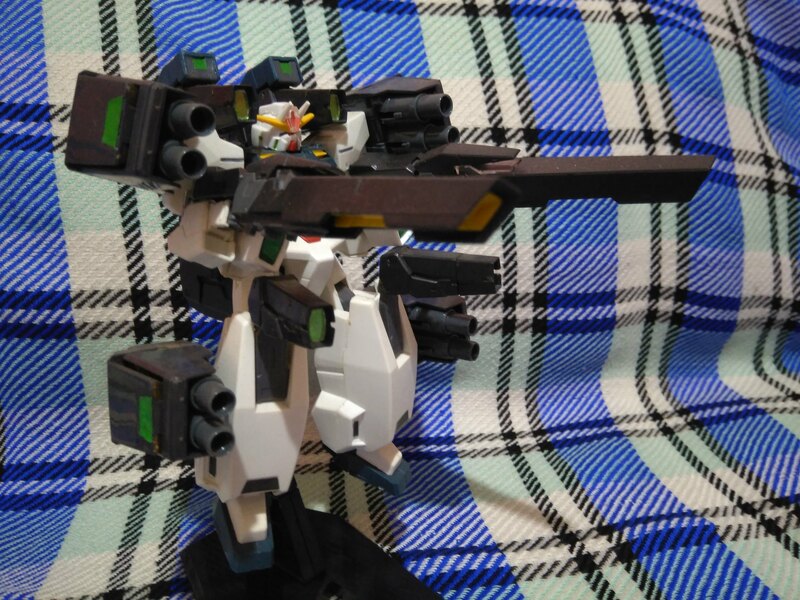 I also gave the heavy beam cannon of the Arios GNHW/M to the Infinite Justice. My most recent additions to this cubicle are the HG Legend and Shiranui Akatsuki. They are just straight builds for now, but I plan to customize their equipment soon to make them match with the rest of the kits in the same cubicle. As can be seen here, the Oowashi pack of the Akatsuki is already built. 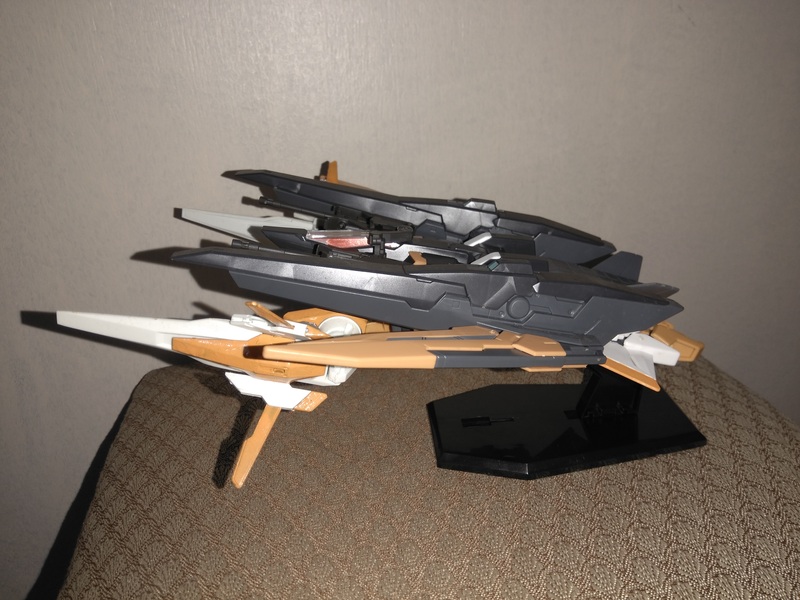 I just have to figure out how to customize it to accommodate the remote weapons of the Shiranui pack. Another cubicle with heavily customized Gundams, this time from the HG 00 line. The Seravee is equipped with 4 of the Virtue's shoulder-mounted GN cannons/condensers; two connected to the shoulders and another two connected to the lower legs. I also customized the side skirt armor to what I think is a better version of the GN cannons found in the GNHW/B configuration. The skirt armor and condenser cannons can all go into storage mode by being flipped downwards. I customized the Seraphim Gundam with the hand beam blades from the HG Garazzo, along with the spiked knuckles. 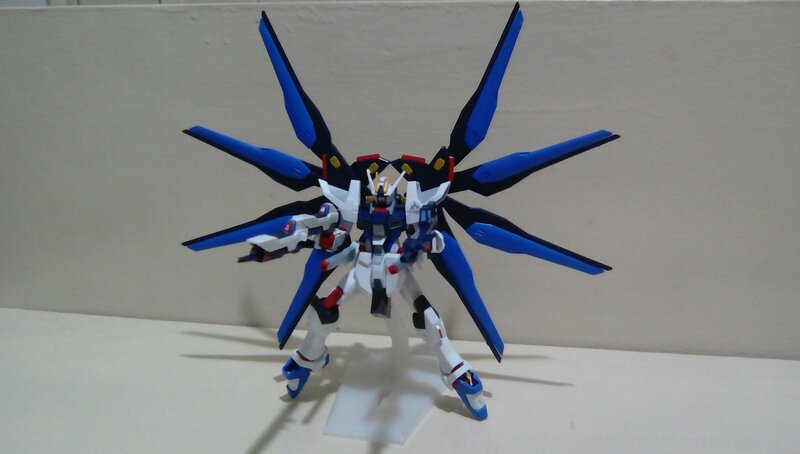 Next, I added the 0 Raiser's "wings" to the shoulders of the Harute, and exchanged its legs with those of the Arios GNHW/M. I decided on this change to give the Harute leg blades to match its gun-blades. 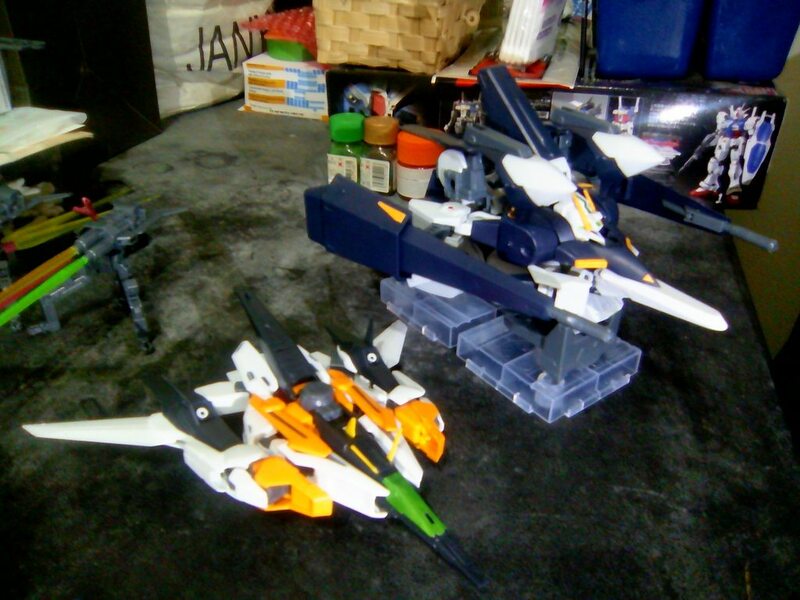 This made the Arios look like a supersonic fighter in MA mode, while the Harute looks more like a heavy bomber. 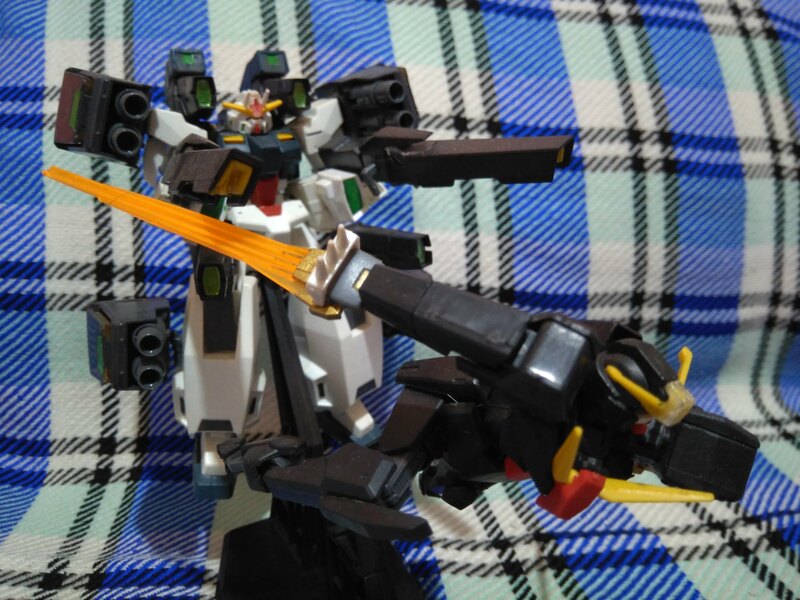 Still, I needed to buy a new Arios and I opted for the GNHW/M version, which is now equipped with the twin beam rifles of the GN Archer and the leg units of the Harute. 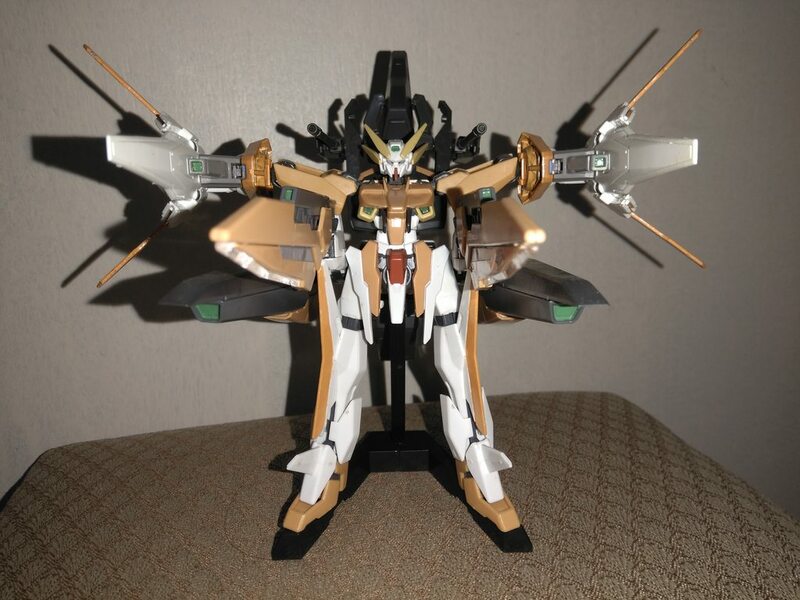 Another addition here is the dual wielding Kyrios. 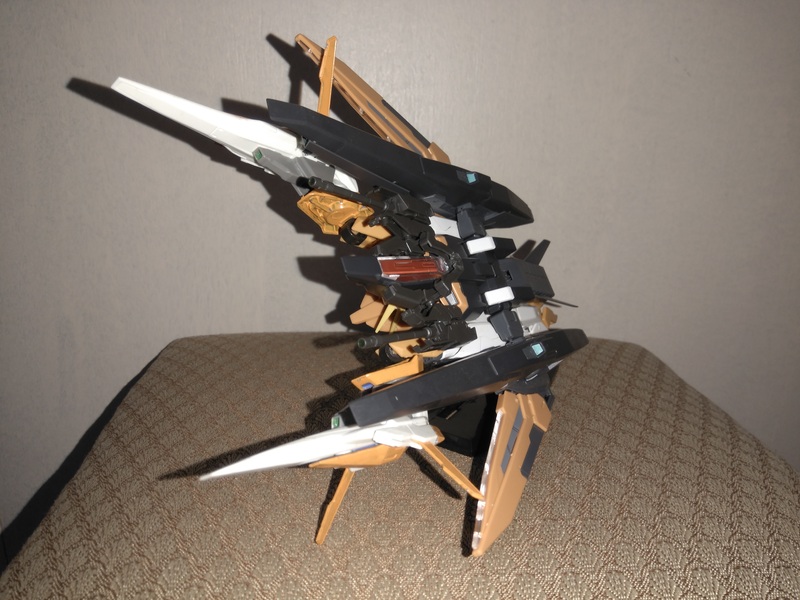 I got it in a kneeling pose to have it fit into the cubicle, but I needed to mod the wing blades on its knees to make this possible. The kneeling Virtue isn't really customized. I just figured that since I bought two of them to customize the Seravee, I'd snap one together for the heck of it. I played around with the extra two leg condensers of the Virtue and found that I could actually work them to fit into the backpack, thereby making it look "complete." My recently purchased Nadleeh isn't customized, either. I just figured it would look great together with the Virtue. That red sticker on the shield was such a nightmare that out of frustration, I dabbed the tip of a toothpick with super glue and applied it to the underside of the sticker just to keep it from peeling off. Surprisingly, it worked. The next addition to this cubicle is the Cherudim FPS Type. I took an HG SAGA, then added a missile launcher and a "shotgun" to its loadout from the HG IBO weapons set. Yes, I know it is a grenade launcher, but the kit already has a grenade rack that it can use to either lob grenades or use them as proximity charges. Given that I want this kit to have an FPS feel, I am designating the weapon as a high capacity, drum-fed SHOTGUN , similar to the Fostech Origin 12. I also modified the hip holsters to accommodate my preferred GN Pistol 2s over the original GN Pistols, giving it a limited CQC option in the form of hatchets instead of being a purely ranged combatant. Finally, I decided to equip its sniper rifle rather than the dinky shield. 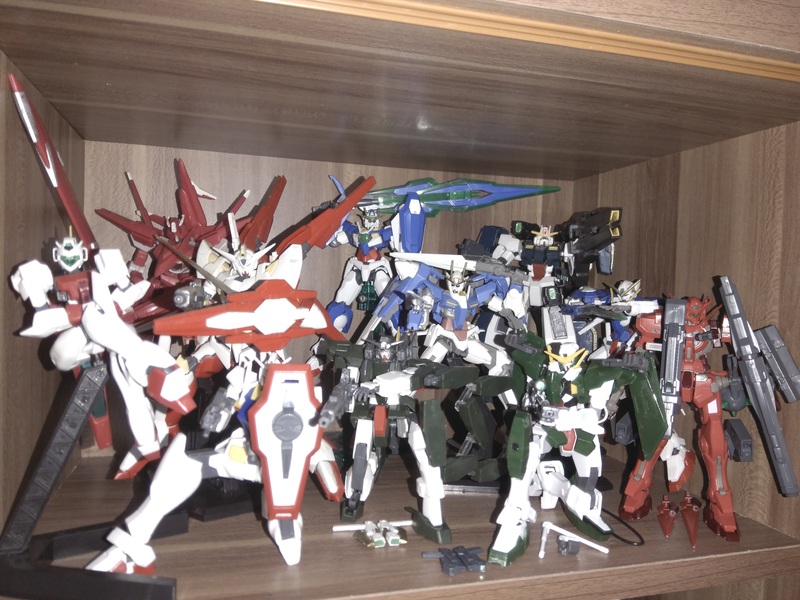 This cubicle is also full, containing all of my 00 HG Gundam-type kits. I was extremely happy when I got the Exia R2 since it has all of the extra parts to rebuild the original Exia sans the power cables. I played around with all of the parts and decided that I would go with the 7 Swords Exia equipped with the GN Sword Kai. I got an Astraea Type F to pair with the Exia, and this just shows how flexible the Exia frame is, being able to equip a vast multitude of weapons. 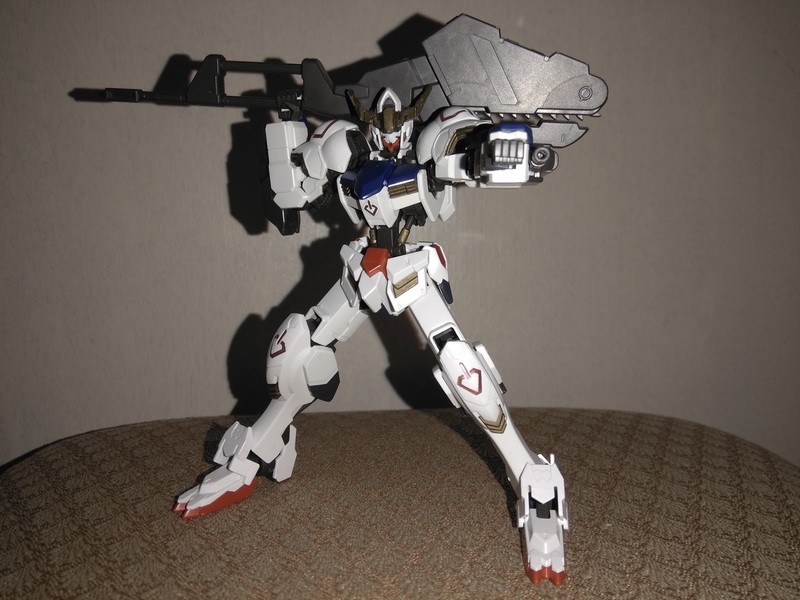 I also did not build the 00 Raiser and just stuck to the original 00 equipped with its twin GN swords and shields. I feel that it looks better this way since it is a melee unit, and the Raiser parts just add too much bulk to it. Not that I dislike bulky suits...its just that I don't think bulkiness suits the 00 well given its combat role. I'm glad that the articulation on the Cherudim allows it to kneel, and I managed to extend the barrel of its sniper rifle after moving a few kits around. Both the 00 qan [T] and the Arche wield buster swords, but I can't really decide on which buster sword design I prefer more. My Reborns seems to have a problem when I try to transform it into cannon mode...the alternate head doesn't go up high enough. Surprising issue there from an original Bandai kit, so I just leave it in Gundam mode. I recently moved my new GN Archer and 0 Gundam to this shelf. Both kits have amazing articulation and space efficiency. They were quite cheap, too. This shelf also contains the stock version of the Seravee GNHW/B. The Seravee that I customized above was its initial iteration. Finally, I decided to add an HG Dynames to this cubicle. The sniper rifle looks great...nuff said. Let's see...2 Virtues, 2 Seravees, 2 Hrairoos, 2 Rozen Zulus, 2 Sinanjus, 2 Arioses, 2 Kyrioses and 2 Destinies. I really need to cut down on buying doubles. Heh. Now for the cubicle containing UC Gundams. Having an HG RX-78-2 Revive is a given, especially since it's an awesome kit all around. 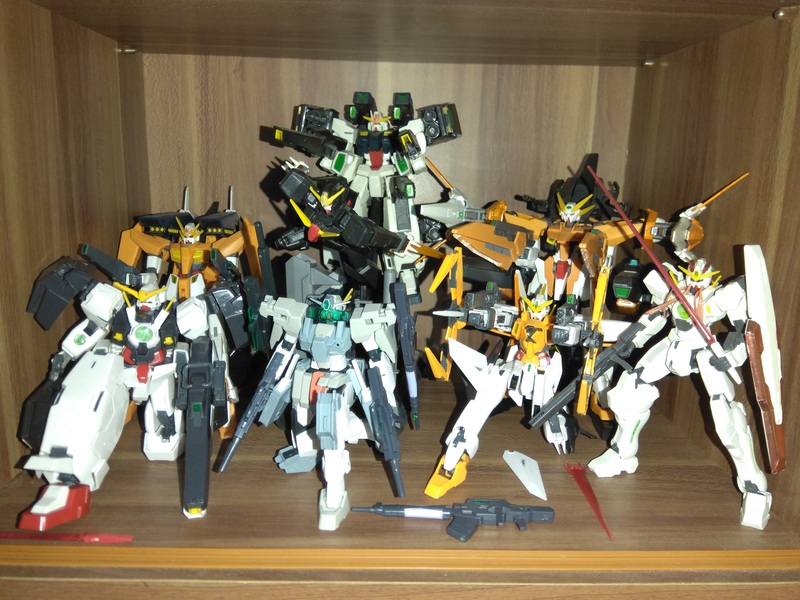 This shelf also contains my sole RG kit: The GP01 Zephyrantes. I finally decided to get a representative kit from the 08th MS Team: the Gundam Ground Type. I didn't think that it would still fit in this cubicle, but I fiddled around with the Nu Gundam and the Assault Buster to make just enough room for it. This also allowed me to move the RG Zephyrantes behind the Ground Type to make room for my recently built HG Mk. II Revive. As with the RX-78-2 Revive, this kit features the same great articulation with an even better color scheme. I love how the Assault Buster mounts and brandishes all of its weapons that come in the box simultaneously, and this is shared by the F91 and even the Banshee. I learned from Kakarot197 on YouTube that it is possible to jam the solid shield of the Assault Buster into the beam shield emitter on its elbow. Worked like a charm. 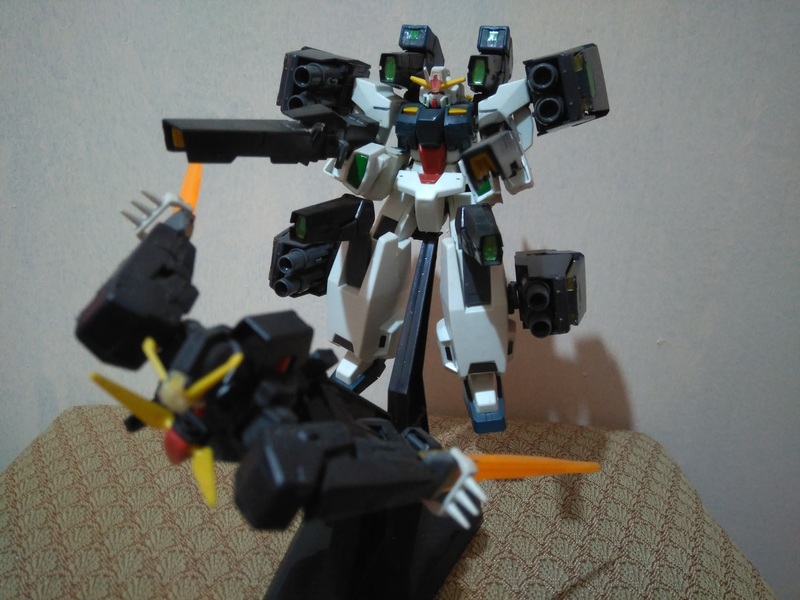 I placed the HGBF Crossbone Fullcloth here since it is identical to the manga UC version even though it was animated as part of the Build Fighters AU. I recently finished painting some of the details on the kit, particularly the gold lining on the open mouth plate. I had to use a toothpick to apply the gold paint to such a small area, and then clean off the excess with a q-tip dabbed with some Gundam Marker Eraser. My Nu Gundam is from MC Model. I just preferred it over the Bandai release since it comes with a vast multitude of accessories, which are all in the same box. I opted to get the Harrison Madin version of the F91 because of the color scheme. It came with yellow parts like the forehead jewel and the feet, which I then used instead of the red parts to give it sort of a monochromatic look. I also got the ZZ, because as I have posted in another thread, I feel that this is one of the most endearing Gundams in the entire UC timeline. The only thing I don't like about it is that it is a partsformer. My most recent addition was the HG Atlas Gundam, which I chose to place here without its sub legs. This is one of the best kits I have ever had the pleasure of building. I decided to pose it kneeling to show off how the kit can do this quite naturally. 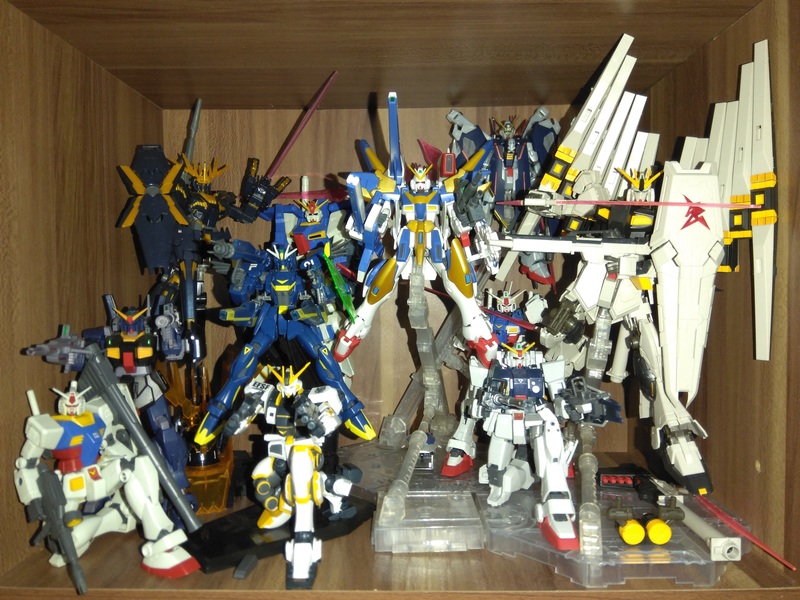 Now to the final cubicle containing the reason why I started out with this hobby in the first place: the Gundam Wing line. 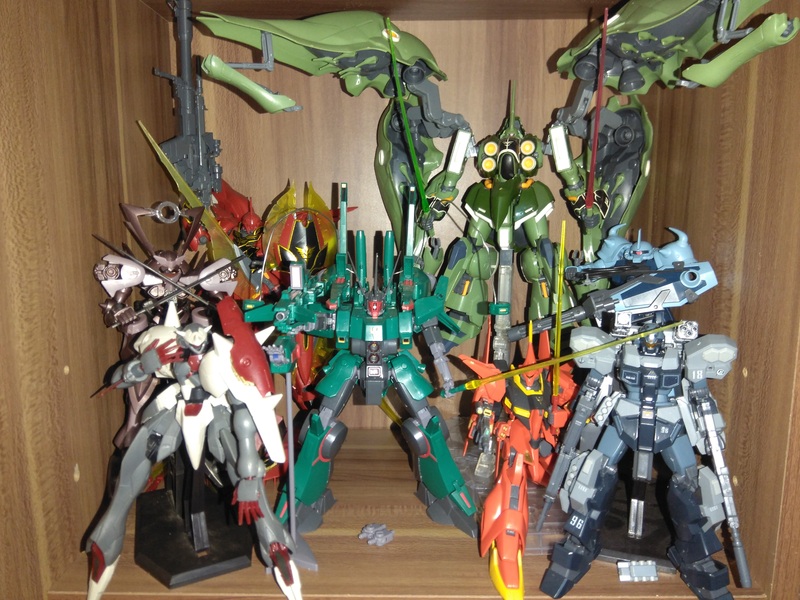 Not all of them are HGs, they just share the same 1/144 scale. The Wing 0 Custom and the Sandrock Custom are both MSiA's. The Epyon, Altron and D-Hell are NGs. 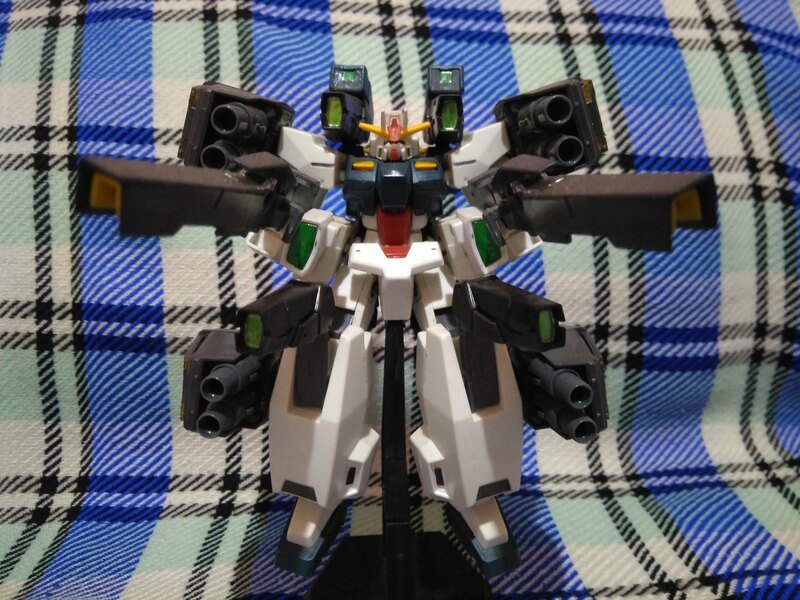 Only the Heavyarms Custom and the Tallgeese III are HGs. This cubicle contains most if not all of my oldest kits, some spanning more than a decade and a half in terms of shelf life. Some of them are so old that damage was inevitable. 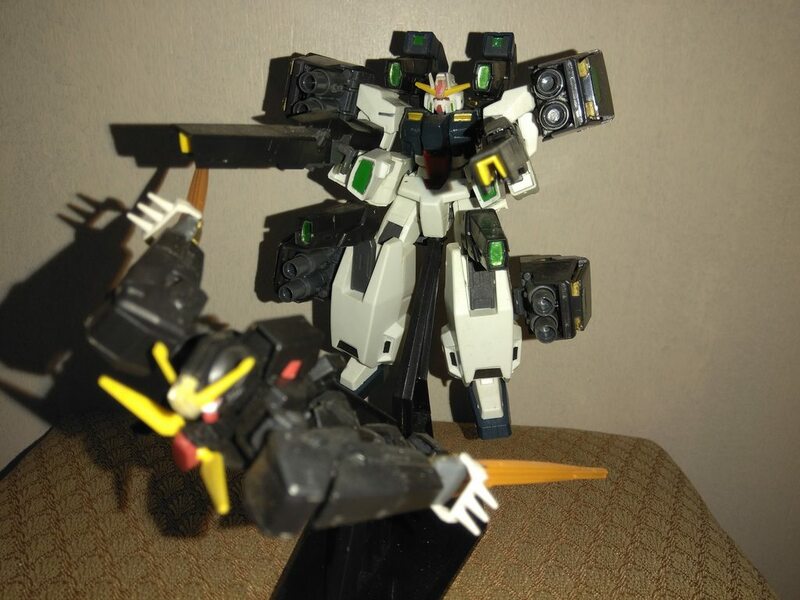 I lost both of the Wing 0 Custom's beam rifles, the Heavyarms Custom's V-fin, the Deathscythe Hell's V-fin and the Altron's shield. I wish I were more careful with them in the past. 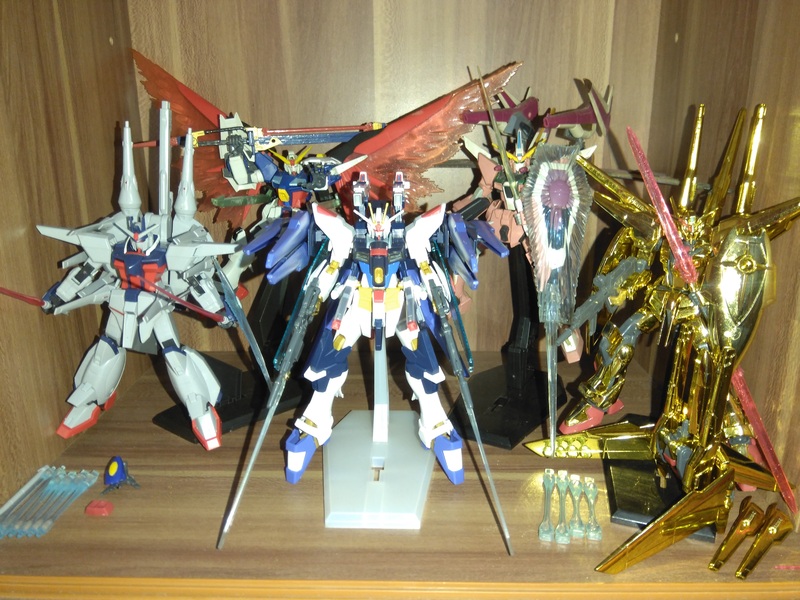 Still, if not for Wing, I never would have come to know Gundam or Gunpla in the first place. So there it is. My full collection for the moment. I may get 5-6 1/144 kits in the future, with two or three of them already planned out. I moved a few kits around and found enough room in 5 cubicles to accommodate 1 kit each. I hope you guys like my collection. Thanks for stopping by. Last edited by mythos-018; April 17, 2019 at 10:37 PM. cool collection; i love how you have it set up. Last edited by mythos-018; March 30, 2019 at 1:11 PM. 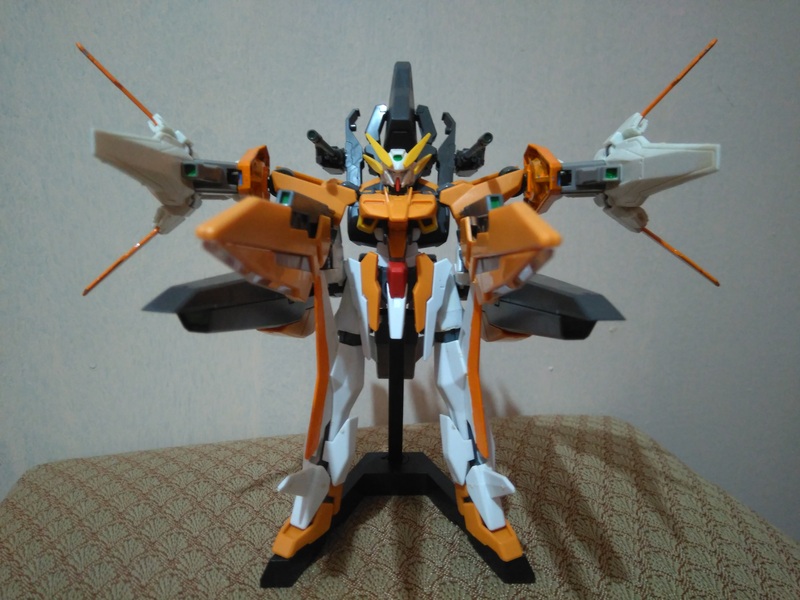 My final take on the Strike Freedom. 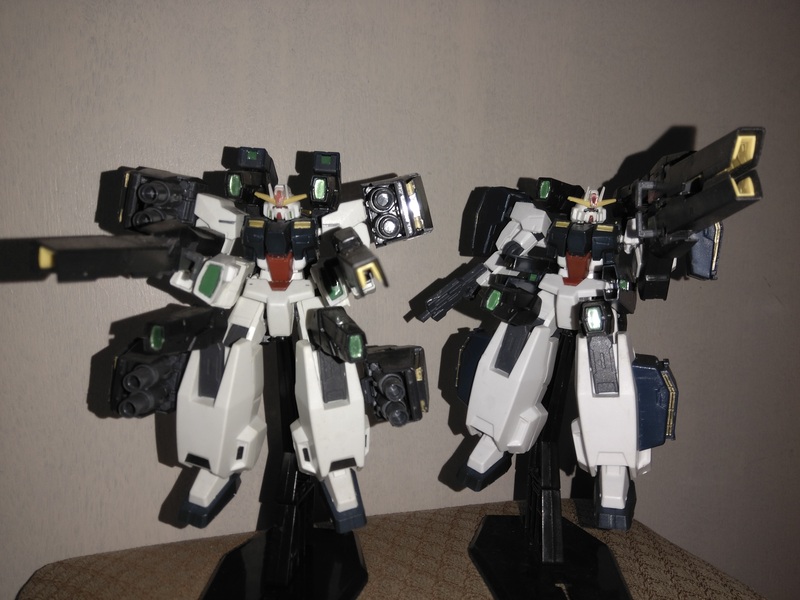 For its handheld weapons, I decided to go with two rifles from the HG Akatsuki...one from the Shiranui and the other from the Oowashi. The beam blades really suit my preferences. And then, there's this. I really have no idea where to put this. The spare parts left over from building my custom Strike Freedom still managed to come together as a complete kit. I just decided to keep it in a box for now. Last edited by mythos-018; March 22, 2019 at 7:17 PM. Adding a few more of my customs...no real changes made to them. Just tried using my new camera to update the images. Since the Zerachiel just came out, here is my take on the original Harute. More pics of my custom Harute, this time in MA mode. I'm quite happy with how this turned out, as equipping guns on the nose cone gave it sort of an external roll cage. 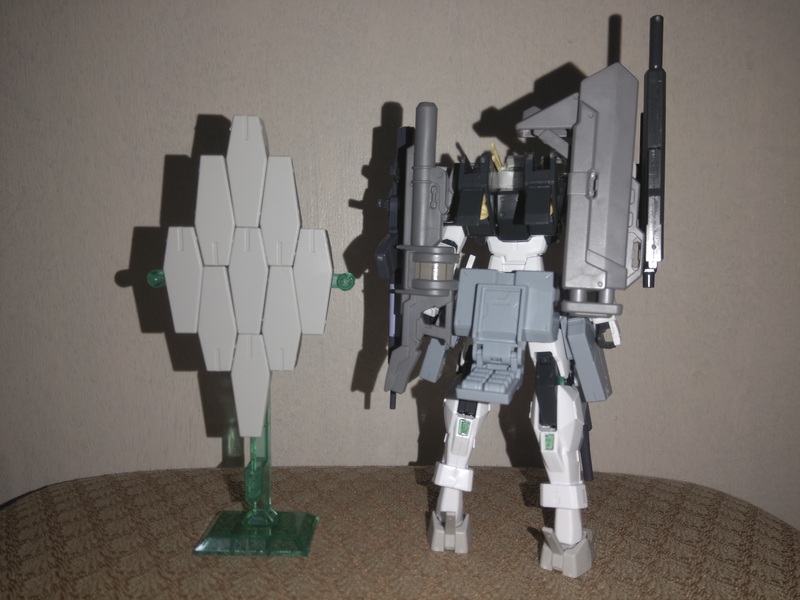 The silhouette looks like a heavy bomber, too...somewhere along the lines of a G-Fortress IMO. By the way, does anyone know how to scratchbuild the scissor bits of the Harute, or am I stuck having to buy the Hobby Star version for those? Last edited by mythos-018; March 22, 2019 at 7:19 PM. 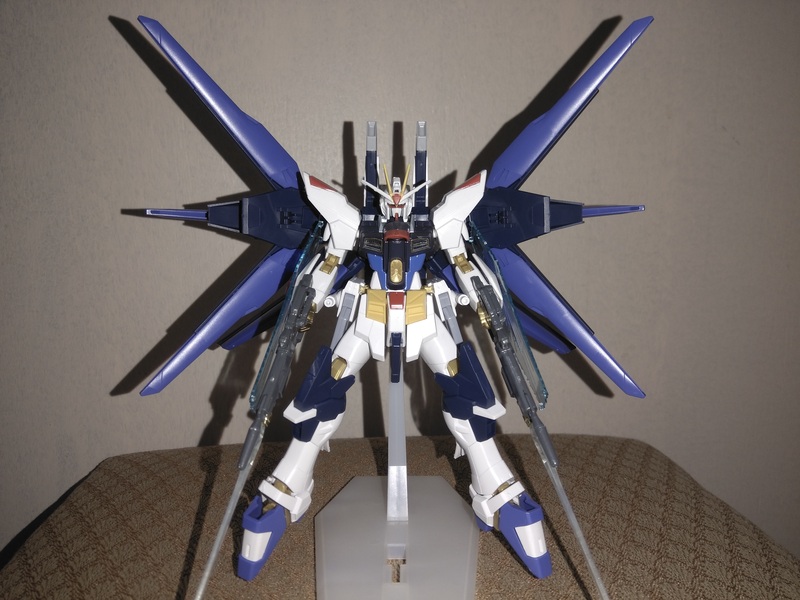 I really like your take on the Strike Freedom. It looks way better painted like that. Last edited by mythos-018; April 12, 2019 at 9:01 AM. Last edited by mythos-018; April 12, 2019 at 9:07 AM. The loadout includes a sniper rifle, a shotgun, a missile launcher, a carbine, two SMGs, two pistols/hatchets and a grenade rack. 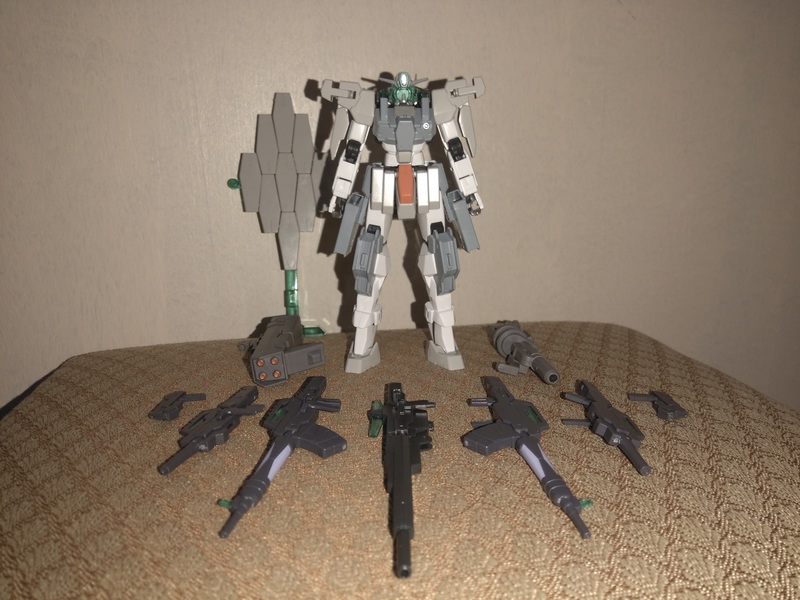 The first time I built this, I didn't think that I would be able to use the GN Pistol 2s given how their storage racks are completely blocked by the hardpoints for the missile launcher and shotgun on the backpack. After a bit of fiddling, I was able to modify the holsters for the original GN Pistols, allowing them to store the heftier GN Pistol 2s. Thanks for sharing your thoughts. 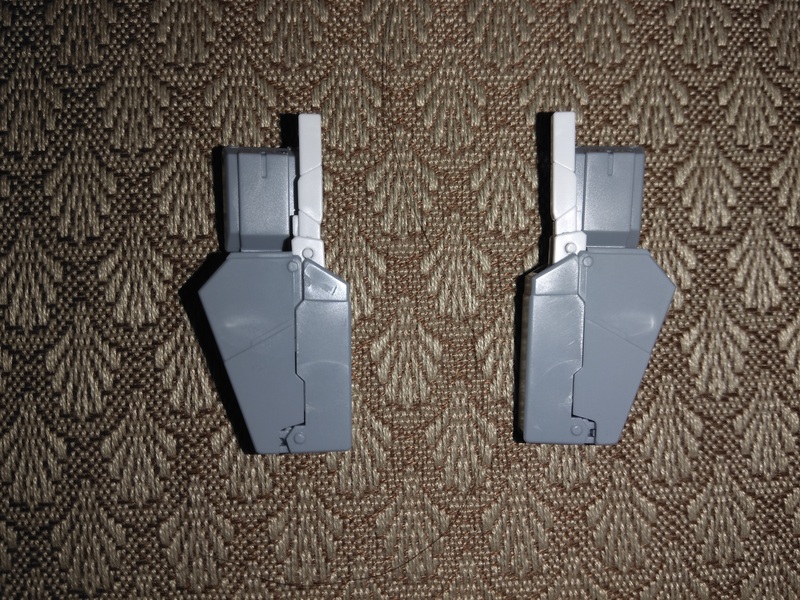 Honestly, when I tried to mod the holsters, I didn't think that my sprue cutter would fit into the pieces. Thankfully, it did because both my Xacto knife and cutter knife were insufficient for the task. Last edited by mythos-018; April 12, 2019 at 5:22 PM. Real world weapon kits that work with 1/100 scale kits. By RileyWarfield in forum Modeling How-To, Tips, and Tricks. Difference in resin kits and regular kits? By elouisM in forum Modeling How-To, Tips, and Tricks.